How to Hide Last Seen on Facebook Chat in Mozilla Firefox is for those who uses Mozilla FireFox to Chat on Facebook. Chat in Mozilla FireFox is not a common tutorial because people barely use Mozilla FireFox to Chat on Facebook. 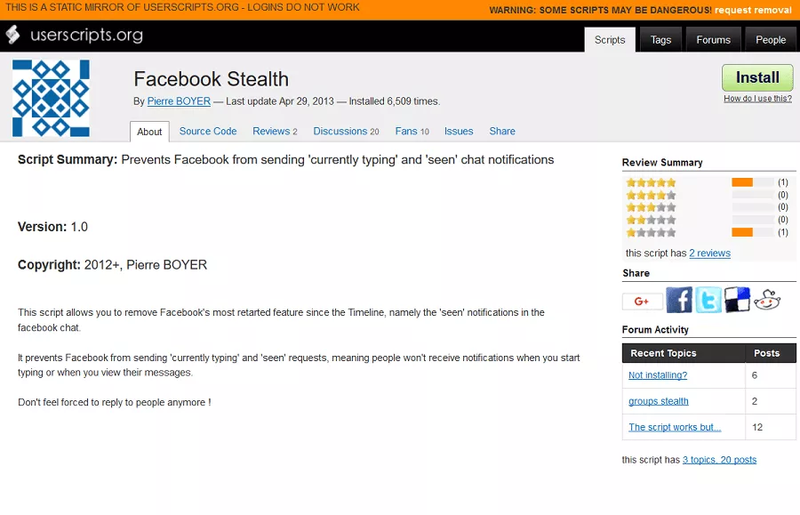 There is a Plugin called "Facebook Stealth" which can be used and activated in Mozilla FireFox. You can Hide Last Seen on Facebook Chat in Mozilla only if you have successfully installed and activated the Plugin Facebook Stealth which we will use to Hide Last Active on Facebook in Mozilla FireFox. Lets run right into the tutorial. 1. If you don’t have Mozilla Firefox installed already on your PC, you need to Download Mozilla FireFox for PC. 2. Download Facebook Stealth Plugin for Mozilla FireFox and Install it on your PC. 3. Once you have successfully installed and activated the plugin on Mozilla Firefox then it will automatically start Hiding your Last Active Time on Facebook Chat.